Sen. Len Fasano and Executive Director of the Connecticut Early Childhood Alliance Executive Director Merrill Gay. 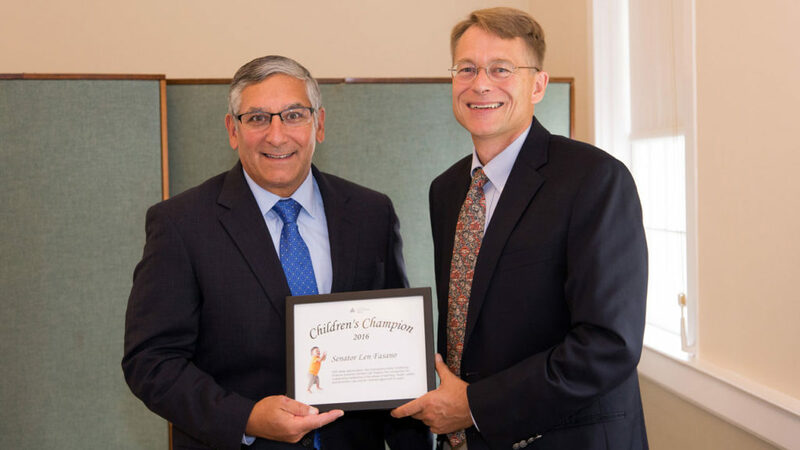 In a Sep. 8 ceremony in Middletown, Senate Minority Leader Len Fasano (R-North Haven) was presented with the 2016 “Children’s Champion” award by the Connecticut Early Childhood Alliance for his leadership on issues related to Connecticut’s young children. This is the second year in a row that Sen. Fasano has been a recipient of this award. Connecticut Early Childhood Alliance is committed to improving outcomes in the areas of learning, health, safety and economic security, for children ages birth to eight. Senator Len Fasano has served the 34th Senatorial District communities of Durham, East Haven, North Haven and Wallingford since 2003. In addition to his current leadership position, Senator Fasano serves as Ranking Member on the General Assembly’s Legislative Management Committee. He also serves on the Executive & Legislative Nominations, Internship, and Planning & Development committees.